This year’s Shubbak Festival offers a selection of Arab theatre works from the sublime to the ridiculous including comedy Love, Bombs and Apples, revealing moments of revelation for four men spread across the globe; satirical all-female showcase Razor Sharp; Now is the Time to Say Nothing, a play and a film that explore the Syrian crisis from both a Syrian and UK perspective; and a classic Egyptian farce, The Tree Climber, written in 1962. This article takes a peek behind-the-scenes to discover more about the works. Rehearsals for Love, Bombs and Apples. This play is set to be hilarious and provocative, reflecting on issues of the day through sharp wit and comedy. 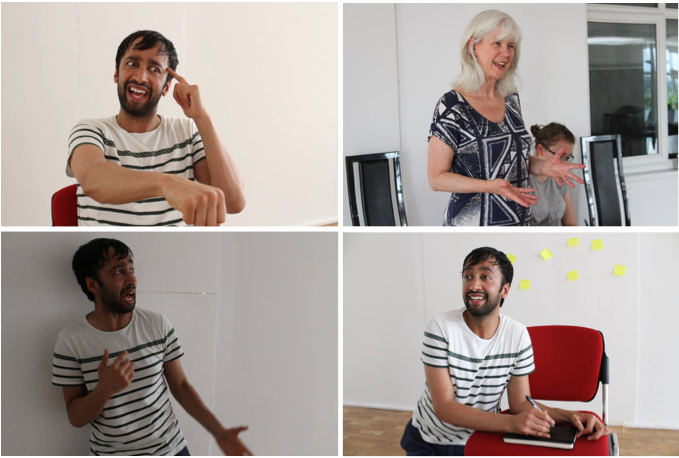 The actor who will be embodying all of these diverse characters is the talented Asif Khan who describes the play as “probably the most challenging adventure I’ll have been on as an actor”. Razor Sharp is bringing a bowl-full of feminism to the performance table with their ‘tell-it-how-it-is’ showcase of Arab satire on Friday 17 July at Rich Mix. Yamina Bakiri, Hannah Khalil, and Malu Halasa each uncover little-known or forgotten issues in the Middle East and present them from a new perspective: from the turbulent role of the Arab protester; the relationship between the White House and Palestine; and the memories of a pre-civil war Syria. But Razor Sharp is as much about who is doing the talking as it is about what is being said – concerned that Arab women are often featured in theatre but are not so often the writers themselves, director Malu Halasa sees this trio of performances as a feminist statement and part of an emerging feminist movement within the Middle East. A touching and important collaboration between young people in the UK, led by director Caroline Williams, and Syrian film maker Reem Karssli, Now is the Time to Say Nothing is a response to, and collaboration with, Reem’s film Every Day Every Day – a “painfully human” portrayal of life for people in Syria during the ongoing conflict. For the new production, Caroline had to find “a group of young people who were brave enough to work together to ask difficult and (perhaps more scarily) simple questions” about the war in Syria. Together with Reem, they have made an immersive sound and film installation that reflects on the detached, disembodied way we learn about the Syrian crisis through the media – through a variety of screens, from computers to television sets. Their mission was to make the audience feel as though they were the ones experiencing the war and that the story is about them, trying to channel the more personal, human element of Reem’s film into their own reflections on the situation, thousands of miles away. Now is the Time to Say Nothing runs from Tuesday 14 – Saturday 18 July at the Young Vic. Rehearsals for The Tree Climber. The man held responsible is only talking to the garden lizard. The detective investigating the crime is being harassed by the Spanish maid. 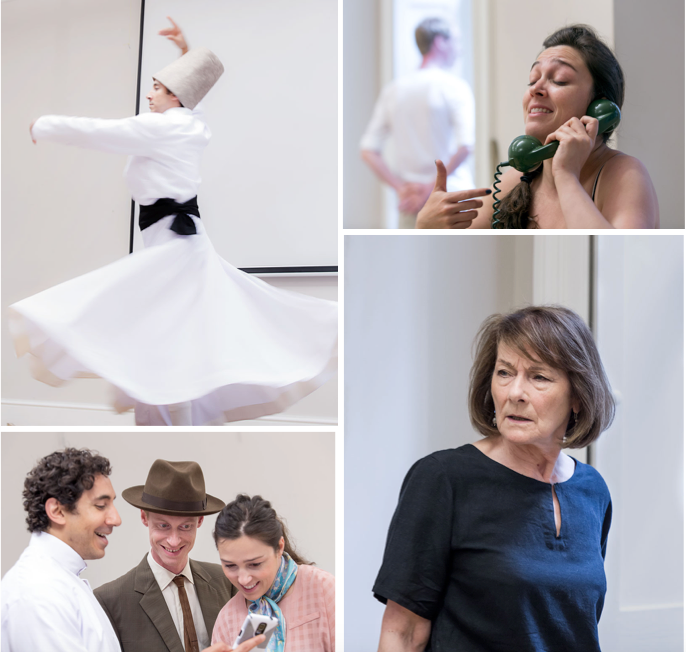 And there’s a time travelling whirling dervish who just won’t stop interfering. Written in 1962 by one of Egypt’s most renowned playwrights of the twentieth century, Tawfik Al Hakeem, The Tree Climber is a classic of modern Egyptian theatre that brings themes of irrationality and absurdity to the stage and will be running from Tuesday 14 – Saturday 18 July at The Cockpit. Still not convinced that this is the play for you? John Game, who plays the detective in the play says: “If you’re the sort of person who laughs at somebody slipping on a banana skin, [this play] has a lot of banana skins for you to laugh at.” Enough said!